“In 2008, Kenny and I sat in statistics class our junior year and never said a word to each other, until our mutual friend Tiara Keyes introduced us. After class, I’m in my dorm room, and I get a Facebook friend request from Kenny Bunch. He sparked up a conversation and then slid his number in my DM (direct message). We talked every day on the stairs of the education building about everything. So, now, graduation was upon us May 8, 2010, and I remember saying, ‘Well, we’re going our separate ways. It was nice knowing you.’ And, I gave him a kiss. “We met in the fall of 2007 in statistics (class). He likes to tell this corny story about how the iPhone had just come out, and I asked to see it and took pictures on his phone. I don’t quite remember it going that way. We didn’t officially begin dating until June 2009, after I graduated. The next year, he graduated and, shortly thereafter, moved back to his hometown of New Orleans. After about a year in NOLA, he moved back to Jackson where we currently reside. “The first time I spoke to Darion was at a forum hosted by his fraternity Phi Beta Sigma, where we engaged in a friendly conversation. Little did we know, a year later, a friendly conversation would blossom into something much more. After completing our studies at Jackson State University in 2014, we both relocated back to my home state of Texas. On June 10, 2016, Darion popped the BIG question while on vacation in San Antonio, Texas, which, of course, I said, ‘YES!’ Our wedding was Sept. 2, 2017, in Dallas.” – Jasmine (class of 2012 and 2014) on her engagement to Darion (class of 2014). “The first time I saw Christian, I was hanging out on the plaza with my friend Se’Mone. Christian stopped by to talk with Se’Mone, and after he left, he sent word to Se’Mone that he liked me and wanted to take me out. I was uninterested at first, but then I finally gave him a chance. Our first date turned into a second, a second into a third, and the rest was history. “We started out as really good friends and then our friendship began to evolve into a relationship. 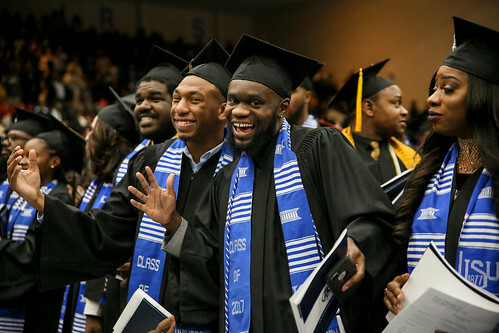 As our time at Jackson State began to come to an end, we began planning our future together. Christian joined the Jackson Police Department after he graduated, and I moved to Atlanta right after I graduated. We maintained a long distance relationship for 11 months. “Christian decided to move back home to Chicago to join the Chicago Police Department. A few months after Christian moved back home, I made the transition to Chicago as well. Christian proposed on October 31, 2016, at his final CPD graduation. I was planning to take a picture with Christian and a few other CPD graduates, so of course everyone had their phones out. “People were counting: ‘1…2…3’ to snap the picture. But, Christian’s coworkers threw out confetti instead, and before my eyes, Christian was down on one knee asking me to marry him. I was so shocked and in disbelief. To make it even more memorable, the news station was there to capture the aftermath of this joyous occasion. After dating for 6 years, I get to marry my college sweetheart in Cancun on April 21, 2018.” – Jade (class of 2015) on her engagement to Christian (class of 2013).